Details: Inaugural North Shore Wreaths Across America Charity Golf Tournament. Proceeds from the tournament to benefit the Wreaths Across American organization. Reg Form: To register your team of 4 players, download and complete the entry form and mail to address listed on form with a check or credit card info. If you’d prefer to register online, you can do so by following this link: click here. Festivities: Leaderboard Air Cannon, Silent Auction, Million Dollar Shot and more. Polo shirts guaranteed to golfers pre-registered by Sep 6, 2018. Tournament will be played in a four-person scramble format. Course & contest rules will be reviewed at start of the tournament. If the golf tournament is canceled due to weather or other events, player will receive a full refund. If player is a no-show, entry fee is non-refundable. On National Wreaths Across America(WAA) Day each December, volunteers place wreaths on individual veterans’ graves in over 1,400 locations throughout the U.S., with ceremonies at sea, and at each of the national cemeteries on foreign soil. 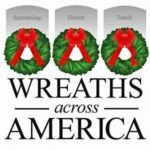 $0.86 of every dollar donated goes toward wreath sponsorships, shipping costs not covered by WAA trucking partners, and fundraising group paybacks. We have sponsorship opportunities that meet your needs and budget, from Title Sponsor to In Kind sponsor available. Download the sponsorship form complete and mail to High5EM or contact Ashley Steeves for additional information: info@high5em.com or 978.594.7050.